A few days ago, I got a little makeover at the MAC counter and ended up purchasing a new foundation brush. I told the makeup artist that I typically put on my foundation with my fingers (true story) and she literally spanked my hand. LOL! 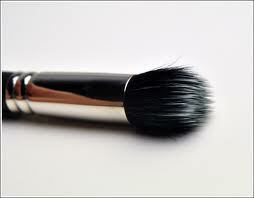 This Short Duo Fibre Brush is the better alternative for sure. I now can put on my concealer and foundation without having to smudge it in with my fingertips. TIP: You should wash your makeup brushes onces a week with a little baby shampoo. Let them air dry.